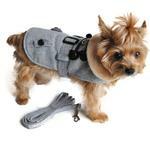 Give your pup a classy look for their walks with the Grey Herringbone Dog Coat with matching leash by Doggie Design. 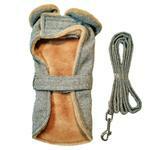 Give your pup warmth and classic style with the new Grey Herringbone Dog Coat with matching leash. This elegant style features a herringbone weave in a wool and polyester blend. 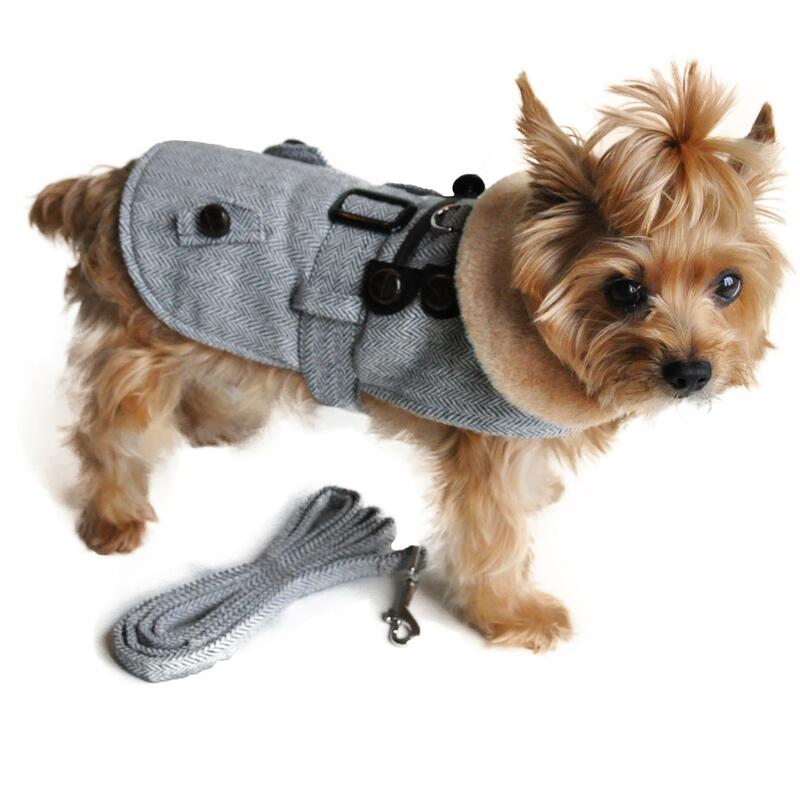 This fashionable coat for dogs also features a faux fur collar and lining in camel. The coat goes on easily with touch fastener at the neck and waistband for a perfect fit. Your pup will be ready to visit a trendy coffee shop or bookstore dressed in this University-inspired look. Thanks to the sturdy D-ring (or leash access hole on XL and 2XL sizes) and matching leash, you'll be ready for a walk at a moment's notice. Posted On 03/07/18 by Jean M E from Trenton, NC Yes, Jean M E recommends this product! Nice coat. Fits well and is nice and warm. The matching leash is nice too. 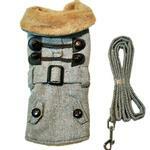 I would not use the leash attachment on a strong puller though, would attach it to a regular collar instead. Am sending some to a rescue. Love this coat and my littles do too. It is nice and warm and fits well. I especially like that it comes with a matching leash. And I really like the herringbone pattern and color. Posted On 01/14/18 by Sandra D from Cape Girardeau, MO Yes, Sandra D recommends this product! Super warm, thick fur inside with herringbone warm outside. I buy things all the time for my little 5 pound dog but have to say this was the best buy I made using my points it was only $10!! Posted On 12/29/17 by sheila G from Chatham, LA Yes, sheila G recommends this product! 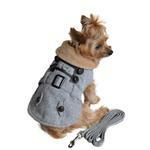 A very nice coat with matching leash.Even preppy looking! Sofia loves it and so do I.Love this store!